The Short Version: Columbia is the fourth most-populous city in Missouri and home to the University of Missouri, Stephens College, and Columbia College. This fast-growing city has a uniquely youthful atmosphere — the average age is around 27 years old according to the 2010 census — that makes it ideal for active daters. Columbia has plenty to see and do if you know where to go. The eclectic downtown and lush parks provide couples with countless date ideas throughout the year. Whether you’re kayaking on Finger Lakes or touring a local winery, you can pass the time with your loved one in an energetic college town in the heart of the heartland. Downtown Columbia packs a lot of fun into a one-square-mile area in central Missouri. The historic architecture of this cultural hub gives the city a youthful Bohemian feel. What really makes the downtown area stand out, though, is its close proximity to three college campuses: the University of Missouri to the south, Stephens College to the east, and Columbia College to the north. Because it is surrounded by college-aged students, the downtown area has an abundance of trendy, affordable, and interesting spots to have fun. Daters often descend on the streets of East Broadway or Cherry Street to enjoy a bite to eat or an indie show. Everyone likes different things on a date. Maybe showing off your creative side at Paint the Town appeals to you. Maybe you’d like to sit back with a cold brew at Logboat Brewing Company. Whatever you have in mind, Columbia has a wide array of date opportunities to meet or exceed your standards. We’ve picked out some of our favorite date spots to give couples in the area some ideas the next time they’re in the mood for a romantic afternoon or evening together. Columbia and the surrounding area is always bustling with lots of cultural experiences to entertain folks of all ages. When planning a date, you might want to look online to see where and when local festivals are happening. From the Hartsburg Pumpkin Festival in October to the True/False Film Fest in March, there are many long-running events to keep daters occupied on the weekends. The Roots N Blues N BBQ Festival has delighted attendees with live music and savory street food for the past decade. Every September, 30+ artists descend on the city to play blues, gospel, country, folk, soul, or rock music. The event also includes a half-mile marathon on Saturday and a gospel celebration on Sunday. Whether you want to unwind at the Unbound Book Festival or jam out during the Hot Summer Nights concert series, you can always find something fun going on throughout Columbia. Since 1997, the Ragtag Cinema has screened independent and international movies to champion the arts and bring movie lovers together downtown. You can watch a flick with your date and then walk over to a local gastropub or taco joint to discuss the film over a bite to eat. Daters can also catch a concert at Rose Music Hall or see a show performed by the Missouri Contemporary Ballet. Such engaging experiences make for memorable date nights. You can check the city’s performing arts page for more information about theatrical and musical groups performing around town. Columbia’s hilly terrain and prairie flatlands are perfect for couples seeking an outdoor adventure. You can take your date hiking at Rock Bridge Memorial State Park, a beautiful oasis just five miles south of Columbia. The natural rock bridge is a popular spot for couples looking for a picture-perfect moment in the great outdoors. Pictured above, Stephens Lake Park is a family-friendly destination full of beauty and activity. If you enjoy kayaking or off-road motorcycling, you’ll love hanging out at Finger Lakes State Park, a 1,128-acre park in Boone County. The spacious campground offers an array of recreational activities, including swimming, fishing, biking, and hiking. Cooper’s Landing Campground & Marina features live music, campgrounds, and a boat dock for families and couples who enjoying roughing it. You can settle in for a rustic evening and dine on the smoked meats at the open kitchen on property. Or you can take a fishing boat on the Missouri River and catch dinner yourself. You don’t have to look very far to find popular dog parks, natural trails, and even a top-tier disc-golf course in this vibrant college town. From biking down the Katy Trail to strolling through the Shelter Gardens, you can plan a special date by checking out Columbia’s outdoor areas. Columbia has over 200 locally owned restaurants, so couples have a lot of options when choosing a place to eat together. You can grab a slice of pizza or sit down to a three-course meal — whatever strikes your fancy. The Kampai Sushi Bar and Restaurant, another great date venue, is open for lunch and dinner seven days a week. You can order sushi, sashimi, bento, and steaming-hot noodle dishes and impress your date with your sophisticated palate. The Japanese restaurant’s sleek modern look make visitors feel right at home, and its reasonably priced and authentic cuisine keep people coming back for more. If you and your crush enjoy sharing bottles of wine together, you can stop by Les Bourgeois Winery and Vineyards in Rocheport to stock up on some of the best vintages in the area. This beloved winery, the third largest in the state, produces over 120,000 gallons of wine each year. It also provides a picture-perfect venue for private parties and weddings. 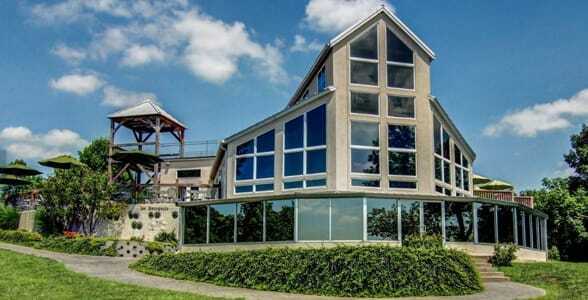 At Les Bourgeois Winery and Vineyards, couples can drink wine on an outdoor patio overlooking the Missouri River. Not every dining establishment in Columbia is all that fancy. This is a college town, so you can always find a cheap and greasy burger at a traditional drive-in like Mugs Up. Since 1955, this burger joint has been known for its home-made root beers, which are topped with a generous scoop of ice cream. The Broadway Diner is another old-school eatery where people can chow down on biscuits and gravy or hash browns and tomato soup. The diner’s indulgent menu satisfies anyone looking for a quick bite to eat in a relaxed atmosphere. Columbia’s downtown district keeps up with the latest trends in fashion, entertainment, and cuisine, and every night it attracts a youthful crowd of singles and couples hoping for a good time. You can take a date here to enjoy a live show or a farm-fresh meal in a lively setting. 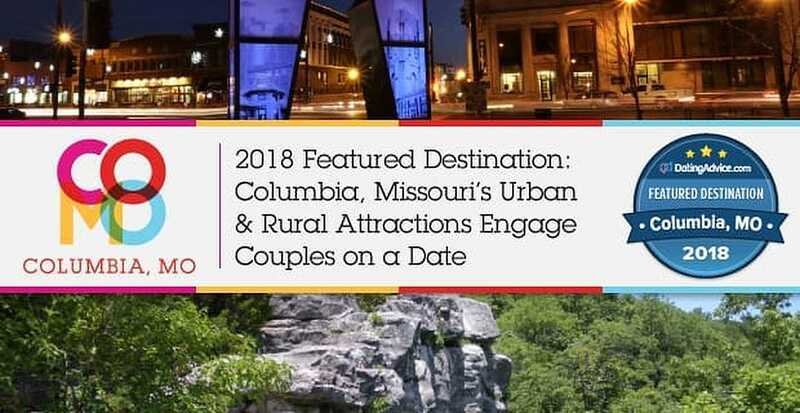 Or, if you prefer to take a romantic excursion off the beaten path, you can go outside the city to camp, hike, fish, or otherwise enjoy Missouri’s public parks. There’s a little bit of everything in this thriving Midwestern city, so all you have to do to have a good time is step outside and take advantage of the date opportunities all around you.